Pioneers in the industry, we offer Gold Plated White Kundan Choker Necklace Earrings Tika, Gold Plated Multi Strand Faux Diamond Filigree Pendent set, Bindhani Indian Wedding Bridal Kundan Pearl Necklace Set, Gold Plated Traditional Kundan Choker Necklace Earrings Tika, Bindhani Ethnic Long Rani Haar White Necklace Set and Traditional Rani Haar Multi Strand Pearl Necklace Jhumki set from India. Jewellery Length:26CM,Jewellery Width:3CM,Earring Length:5.5CM,Earring Width:2.5CM,Mang tikka Length:12.5CM,Mang tikka Width :2.5CM,Weight:117Gram, Imitation Kundan , Diamond and Gems Stones Used. Can be worn for engagement and wedding parties, And go with ethnic or traditional out fit. Easy to wear and put on. High Quality Workmanship and Corrosion Resistant Metal - last you long time. Ball chain is made with Brass metal which is very soft , Shine and smooth. Extremely light weight kundan, faux pearl, white CZ stone linked set with earring pair and mang tika. Perfact for a bride or bridemaid in pre-wedding ocaassion. Goes well on traditional inidan attire or fusion attire like wedding gown or lehanga skirt. Jewellery Length:24CM,Jewellery Width:2CM,Earring Length:5.5CM,Earring Width:2CM,Mang tikka Length:14CM,Mang tikka Width :2CM,Weight:91.5Gram, Imitation Kundan , Diamond and Gems Stones Used. Stones are glued properly. CZ stone and semi precious stone used in making. Can be adorn with indian ethanic attire on a ocassion. Elegant product to create your own statement style. Bindhani brings you a hand crafted contemporary rani haar with gold plated beads wovwn in multi strand chains for the modern indian bride or bride made. Green cubic zirconia and polkies will complimente your attire if you will team it with ethnic indian enseamble. Earraing and mang tika along with long fahionable statement lenght of this necklace....will complete thr bride look. Can be worn for engagement and wedding parties, And go with ethnic or traditional out fit. Easy to wear and put on. High Quality Workmanship and Corrosion Resistant Metal - last you long time. Kundan , Pearl and Diamonds are Imitation! Light weight, Unique, Originally Design and crafted by Bindhani artisan. Set has option for 5 Changeable Color in Blue, Purple, White and Rani Pink and Red. Enriched with kundan, cubiz zirconia and colored stone. Full set to match your bridal outfit. This traditional long rani haar jewellery set is perfect choice for any age of women or college teen girls. Long necklace set made in excellent quality of alloy metal and round ball chain with antique look high gold plated. This Kasu Haram necklace set Can be wear in Wedding , Festive or Party . Trendy and fancy stylish Earrings set can be team with any ethnic ensemble attire for a stunning lavish look in party or head out. This necklace set or Rani haar is yellow gold plated antique temple jewellery set.....inspired from ancient sculpture of south indian temple. Small shiny golden balls, blossom pearl and glittering cubic zirconia are studded to enrich the taste of temple jewellery. High quality copper used in manufacturing to make this piece hypoallergenic and perfect set for wedding and engagement. If you are a resale grab this jadau rani haar and impressed your customer on your door step itself by your high end royal collection of jewels. This Bindhani traditional long rani haar jewellery set is perfect choice for any age of women or college teen girls. Long necklace set made in excellent quality of alloy metal and round ball chain with antique look high gold plated. This Kasu Haram necklace set Can be wear in Wedding , Festive or Party . Trendy and fancy stylish Earrings set can be team with any ethnic ensemble attire for a stunning lavish look in party or head out. _long lasting if handle with care. Show off your vivacious side with these alluring glitter gold ball chain necklace set with a design so magnificient , add this piece to your look for this wedding / festive season to match it as a Rani haar or Kasu haram set with best indian ethnic wear. Team it with golden clutch and high heels to fetch lot of compliment for your rich sense of jewels. Bindhani brings to you hand crafted gold plated contemporary rani haars with golden beads woven in multistrands chains for modern indian bride. Each chain is representation of the bond initiated by craftsman ship of bindhani. Circular pendants in iddle of the chains, classy earrings and statement mang tika are the shizz.....very intricate and wearable set for the wedding or pre-wedding funcions. This long gold plated necklace set is versatile to fit on any color indian traditional attire. _earrings secure with post and back lock. Maroon Green cubic zirconia, red polki, gold plated ball chains strands and a final classy touch .....all together makes this set vivacious piece to be worn on a wedding evening. HIgh quality alloy metal, high gols long lasting plating, earring secure and safe and easy to wear. 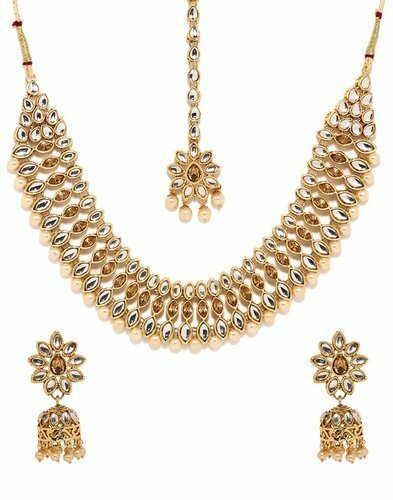 Bridal Set for Wedding from Bindhani:Beautiful light weight gold necklace set with earrings,hathphool, nath, hathbandh and mang tikka. Delicately hand crafted to deliver the best experience for a bride. Add elegance and beautify your personality manifold by wearing this artistic piece._Copper made_golden antique polish_royal look_Contents: Mang tika, Earrings,long necklace, Hasali choker,arm lets, and nose nath ring. This traditional rani haar jewellery is perfect choice for any age of women or college teen girls. Necklace made in excellent quality of alloy metal and round ball chain with antique look high gold plated. This Kasu Haram necklace Can be wear in Wedding , Festive or Party . Add a dash of charm to your slik saree by teaming this piece with ramleela earring pair and red large bindhani. Bring the real women hood out. This traditional rani haar jewellery is perfect choice for any age of women or college teen girls. Necklace made in excellent quality of alloy metal and round ball chain with antique look high gold plated. This Kasu Haram necklace Can be wear in Wedding , Festive or Party . Long rani haar enriched with polki and met gold effect to be compitable with traditional attire like lehanga saree or crop top with long skirt. Stones are glued properly. Imitation Pearl and Kundan and stone Used. Statement jewelary look goes well on ethanic saree, traditional lehanga. Stones are glued properly. Imitation Pearl polki and meenakari Used. Extremly light weight , yeloow gold met finishdh polish, elegant, dignified necklace set to be compatible with saree, lehanga or indian traditional attire. Gold plated copper with immerced pearl beads articulated in it...traditional touch , earring pairs to be team with. Can be adorn in a wedding, ocassion with indian traditional attire like saree, lehanga etc. Close up pictures taken to show details in item, So item May looks larger. Please read above descriptions for size and refer to a ruler if needed.